John is very different from the other three Gospels. Writing many years later gave him a unique perspective on the meaning of the life and message of Jesus Christ. John and his brother James were the sons of a fisherman named Zebedee, but Jesus nicknamed them “Boanerges, that is, ‘Sons of Thunder’” (Mark 3:17) perhaps because of a fiery disposition (Luke 9:54). Their mother was one of the women identified as being present at the crucifixion of Jesus (Matthew 27:56). It appears that the mother and sons had all become involved in the vital work and ministry of Jesus Christ. John was a Jew who was an eyewitness to the life, ministry, miracles and message of Jesus. It seems his disposition changed over the years. By the time he wrote his Gospel near the end of the first century, he would often humbly write in the third person, not mentioning that he was the person who was present at an event. Another example is John 1:35 where two of John the Baptist’s disciples are mentioned. In John 1:40 we find that Andrew was one of them, and he was going to look for his brother Peter. Since the apostle John records this incident, it seems likely he was the other of the two disciples. More telling are John’s references to the disciple “whom Jesus loved” (see John 13:23; 19:26; 20:2; and 21:20). Readers through the centuries have recognized this as an obvious reference to John himself. The central doctrine in the book is that Jesus is God and the Son of God (John 1:1-5). The key to the content of John is found in John 20:30-31: “And truly Jesus did many other signs in the presence of His disciples, which are not written in this book; but these are written that you may believe that Jesus is the Christ, the Son of God, and that believing you may have life in His name” (emphasis added). These three words give us insight into the message John wanted to show his readers: signs, believe and life. In the Gospel of John most of the emphasis is on Jerusalem and Judea, with an occasional reference to Jesus’ ministry in Galilee. John spends much of his book writing about the final few days of Jesus’ earthly ministry. Much of what we know about what Jesus thought and the emphasis of His gospel message in His final hours before His arrest and crucifixion are found exclusively in the Gospel of John. Much of what we know about what Jesus thought and the emphasis of His gospel message in His final hours before His arrest and crucifixion are found exclusively in the Gospel of John. Jesus’ personal relationship with various individuals is stressed. There are 27 interviews noted in John—some extensive, some brief. The Son of God is shown to be very much involved with each person He meets. He shows a genuine interest and personal involvement with His creation. John records several long discourses that highlight the truths taught by Jesus and also combat the heresies faced at the end of the first century by John and God’s Church. William Barclay explains: “A certain type of heresy which was very widely spread in the days when the Fourth Gospel was written is called by the general name of Gnosticism. Without some understanding of it much of John’s greatness and much of his aim will be missed. The basic doctrine of Gnosticism was that matter is essentially evil and spirit is essentially good” (The Daily Bible Study Series Revised, The Gospel of John, Vol. 1, 1975, p. 12). The early New Testament Church had to face the false teaching that Jesus, the Son of God, was not physical. This is likely one of the primary reasons John begins the book with powerful statements about the very nature of Jesus, the Son of God—God Himself—who came in the flesh. John shows that God became flesh and literally gave His own life to pay for the sins of humanity and that He lived a perfect life in the flesh. The reader of the Gospel of John will also note that there are no parables in the book. John portrays Jesus as a dynamic individual bringing the good news of the Kingdom of God sent directly from the Father and taught and lived by Jesus Christ. The changing of water into wine (2:1-11). The healing of the nobleman’s son (4:46-54). The healing of the impotent man (5:1-9). The feeding of the 5,000 (6:1-14). The walking on water (6:16-21). The healing of the blind man (9:1-12). The raising of Lazarus from the dead (11:1-46). Early encounters in Jerusalem, Samaria and Galilee (2:12-4:54). Healing and discourse in Jerusalem (5:1-47). Further signs and discourses in Galilee (6:1-71). Jesus at the Feast of Tabernacles (7:1-8:59). Further healing and teaching (9:1-10:42). Death and raising of Lazarus (11:1-57). Close of the public ministry in Jerusalem (12:1-50). Jesus with the disciples (13:1-17:26). Passion and resurrection narratives (18:1-21:25). 1. “I am the bread of life” (6:35, 48, 51). 2. “I am the light of the world” (8:12; 9:5). 3. “I am the door of the sheep [sheepfold]” (10:7, 9). 4. “I am the good shepherd” (10:11, 14). 5. “I am the resurrection and the life” (11:25). 6. “I am the way, the truth, and the life” (14:6). 7. “I am the true vine” (15:1, 5). “Before Abraham was, I AM” (8:58). “I am the Son of God” (10:36). “I am a king” (18:37). These are helpful keys to appreciating and understanding the living Christ in His ministry to us today. 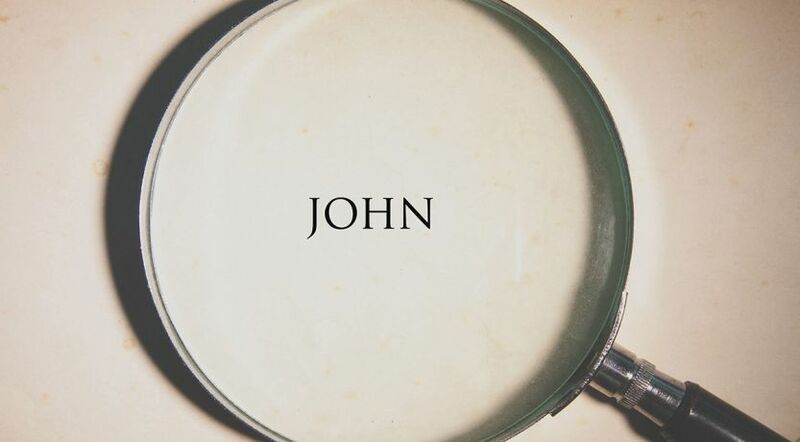 John’s perspective of Jesus’ life and ministry was unique. He was one of the earliest disciples chosen by Jesus. As a fisherman, he was used to hard work and dependence on the physical elements to be successful. He was not removed from the everyday lives of his fellow human beings. He knew what it was like to be cold, wet and hungry. He was down-to-earth but exceptionally deep in his understanding of the very nature of Jesus, the Son of God. John knew very well the physical person, Jesus, who was also God in the flesh. God obviously used John in a special way to help humans from all ages know that Jesus was the Logos, the Word, become flesh. He was God, the Son of God. John witnessed Jesus’ patience with himself and James, the “Sons of Thunder.” He saw Jesus correct those He loved and rebuke His dissenters and adversaries, yet he knew that Jesus went through agony and suffering to demonstrate His willingness to forgive all humans of their sins. John’s Gospel offers special insights into the compassion of Jesus, the love of Jesus and the nature and gospel message of Jesus. John records several occasions in which Jesus taught dogmatically that He could do nothing except the Father did the works (John 5:19, 30). Jesus’ actions and teachings direct us to look to the Father and follow the example that Jesus set for all humanity. Jesus taught emphatically that He had to depart, but another Comforter, God’s Holy Spirit, would be sent and would be in the true followers of Jesus Christ (John 14:12-18). John’s final comments give a glimpse of a man trying to wrap his mind and heart around the individual to whom he devoted his life of service. John wrote: “And there are also many other things that Jesus did, which if they were written one by one, I suppose even the world itself could not contain the books that would be written. Amen” (21:25).